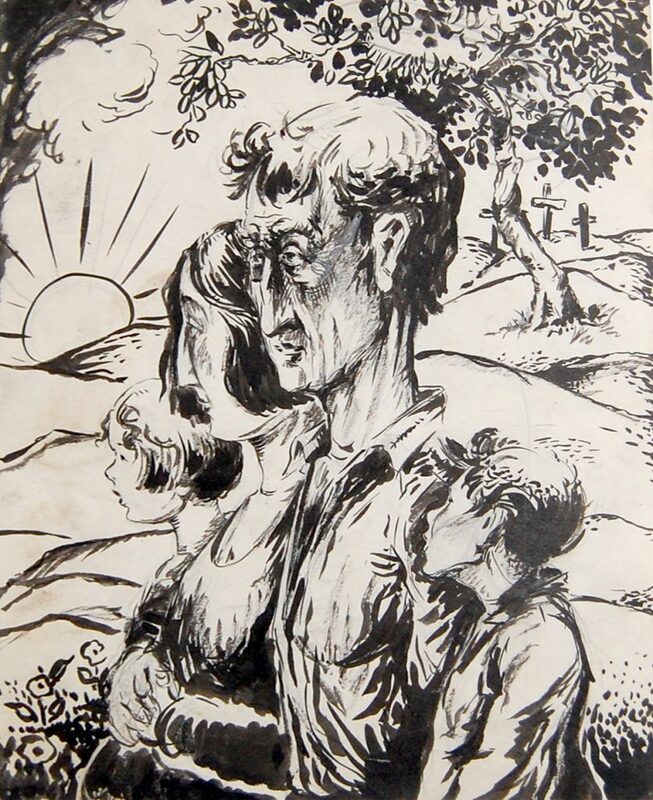 „Farmer“, USA, early 1930ies, ink drawing on paper. Carl Ritz was born in 1892 in Frankfurt-Grieszheim. In his youth he became a sailor and travelled as far as Australia. In 1914 he took art lessons at the Royal Art Society in Brisbane. With the beginning WWI, Ritz was imprisoned for being German. In the camp he became friends with the illustrator Kurt Wiese (1887-1974) who today is best known for his illustrations of Felix Saltens „Bambi, a life in the woods“ of 1928. In 1919 Ritz returned to Germany and finished his art studies at the Academy of the Arts, Berlin, as student of Kaethe Kollwitz and Arthur Kampf. He joined the Bauhaus Weimar and founded in 1923 a dancing chorus with whom he travelled Europe until 1926. He left to New York where he moved in with his friend Kurt Wiese. Later on he worked as painter and illustrator in Flemington, New Jersey. Carl Ritz died in 1952 in Flemington. Source: Post Fine Art, Campaign to save old Indian murals in Flemington“s Union Hotel, NJ.com, 2011.